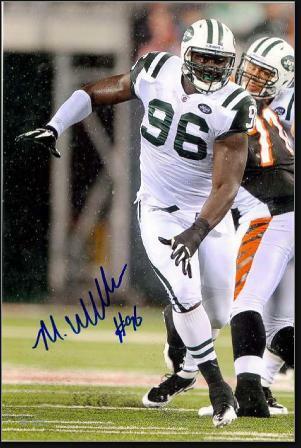 Muhammad Wilkerson was born on October 22, 1989 in Linden. Raised in Linden and Elizabeth, he is the son of Janice and Alvin, a former high school defensive tackle. The Wilkersons were Giants fans. They encouraged their son to play football, but he was limited to a single season of youth-league ball because he exceeded the weight limit. So Muhammad channeled his quickness and power into basketball. At Linden High School, Muhammad grew to 6’4 and continued to play basketball. However, varsity football was now his primary focus. He played on the defensive line for the Tigers and head coach Bucky McDonald knew he might have a future pro on his hands when Muhammad dominated future NFL first-round offensive tackle Anthony Davis in a New Jersey state playoff game. Muhammad was on a lot of recruiting lists, but his academics were not up to Division-I standards. He spent a fifth prep year at Hargrave Military Academy, where he played with future Jets teammate Quinton Coples. Muhammad had formed a good relationship with Temple coach Al Golden, and after a year at HMA he accepted an athletic scholarship with the Philadelphia school. Muhammad started every game as a sophomore in 2009 as the Owls went 9–3 and played UCLA in the Eagle Bank Bowl. Playing defensive tackle, Muhammad recorded 58 tackles, including 6 quarterback sacks. In 2010, he upped those numbers to 68 tackles and 9.5 sacks and was named First-Team All-MAC. Senior defensive back Jaiquawn Jarrett—who would become a teammate of Muhammad’s with the Jets in 2013—also made First-Team for the Owls, who finished the year 8–4. Projected as a high draft pick, Muhammad decided to skip his senior season and declared for the 2011 NFL Draft. His mother made him promise he would return to Temple in the future to earn his degree. Muhammad further improved his stock with good showings at the NFL Combine and Temple Pro Day. At 6’4” and 315 pounds, Muhammad impressed scouts by running the 40 in under 4.9 seconds. The Jets took Muhammad in the first round with the 30th overall pick. He was the highest draft pick from Temple since Paul Palmer went #19 in 1987. Muhammad won a starting job out of training camp and proved capable of playing defensive end or defensive tackle, depending on the team’s defensive scheme. He had 2 sacks as a rookie and also forced a safety in his second pro game, against the Jacksonville Jaguars. In 2012, Muhammad notched 5 sacks and also returned a fumble for a touchdown. In 2013, Muhammad led the Jets with 10.5 sacks and also forced two fumbles and intercepted a pass. His performance earned him Second-Team All-Pro honors. Muhammad’s sack total dropped to 6 in 2014, but in 2015 he bounced back with a 12-sack campaign. He demonstrated great athleticism, lining up occasionally inside and beating interior linemen to make huge plays. He had 64 tackles in 16 games and was a Pro Bowl pick for the first time. Unfortunately, Muhammad broke his leg in the final game of the year. In 2016, Muhammad played in all but one game and racked up 58 tackles and 4.5 sacks. After a second subpar season in 2017, the Jerts released him, citing disciplinarey issues. During his time with the Jets, Muhammad started the T.E.A.M. 96 Foundation, which helps high school athletes to become productive, law-abiding citizens who give back to their communities. Also, Muhammad has a tattoo of his mother Janice's name inside a breast cancer ribbon to honor and spread word of her survival of the disease. In the spring of 2018, the Green Bay Packers sign Muhammad to a one-year deal. In the third game of the season he suffered a season-ending ankle injury.